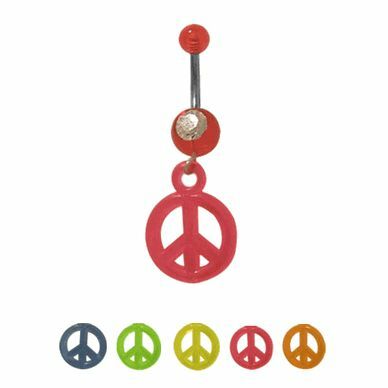 This dangling UV acrylic peace sign belly button ring is a conversation piece made with a 316L stainless steel shaft, UV peace sign, red UV beads and a clear cubic zirconia jewel. The peace sign is available in your choice of blue, green, yellow, red, and orange. This belly ring is 14 gauge and the length is 10mm - 3/8 of an inch. The externally threaded top bead size is 5mm and the bottom is 8mm. Entire piece is nickel free.